Manufacturers cast cinder block, also known as concrete masonry units, from pumice or clay and concrete to form a lightweight, hollow block. Cracks in basement walls allow water to enter the basement, which leads to mold and mildew growth. 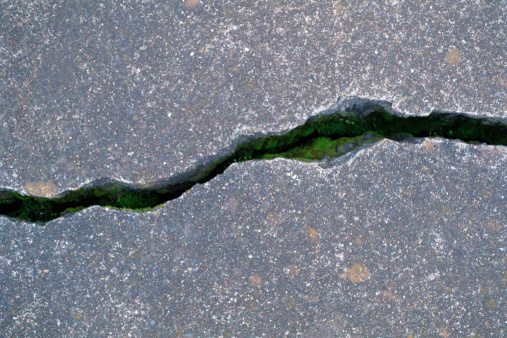 Filling a small and moderate crack is necessary to prevent unhealthy conditions in the home. Large, unstable or growing cracks require a professional inspection to determine the structural stability of the basement before filling. 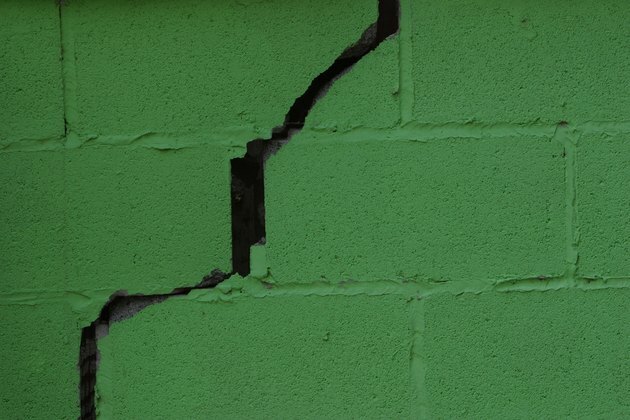 Save money by repairing cracked cinder blocks yourself. Pick out loose pieces of mortar by hand. Brush the crack with a wire brush to work loose and remove excess mortar. Vacuum the debris out of the crack with a shop vacuum. Add 1/2 gallon of water and 1 to 1 1/2 teaspoons of dish detergent to a bucket. Dip a nylon scrub brush into the cleaning water and scrub the crack to remove dust, debris and dirt. Dry the crack with a rag and let the crack dry for one to two hours. Cut the tip off a bottle of ready-to-use concrete crack-filler with a utility knife. Insert the tip of the bottle into the cider block crack. Squeeze the bottle while moving it along the length of the crack, filling it until it is flush with the cinder block surface. Place a masonry cold chisel along the line of the crack and hit the handle with a masonry hammer to chip off excess mortar and even the edges of the crack. Hold the chisel at an angle to the wall to undercut or chip into the crack and giving the hydraulic cement a shelf on which to sit. Remove loose pieces of mortar by hand. Rub the crack vigorously with a wire brush to loosen and remove mortar from the interior of the crack. Vacuum the cinder block crack with a shop vacuum to remove loose mortar, dirt and debris. Scrub the crack with soapy water and rinse with clear water to remove excess dirt and oils. Mix fast-setting hydraulic cement with water according to the manufacturer's instructions. Only mix enough hydraulic cement that you can apply within three to four minutes. Hydraulic cement sets quickly and cannot be reactivated with water. Put on thin, disposable gloves. Roll the hydraulic cement between your palms until it is warm, making a thick snake-like strip. Place the hydraulic cement into the crack and pack it in with your fingers. Use the tip of a pointed trowel to smooth and flatten the hydraulic cement patch. Continue to mix, roll and pack the crack until hydraulic cement fills all weeping cracks.